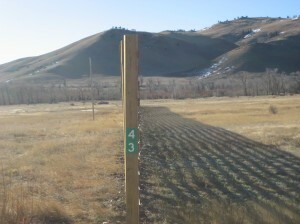 This week’s numbers in the real world: numbers on snow fences. 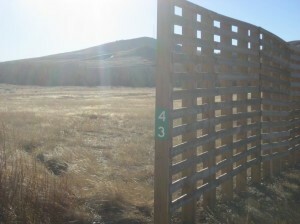 Did you know that snow fences have numbers? They do. At least in Wyoming they do. Here’s a nice snow fence with a nice number: 43. Snow fences do a good job of helping to keep the snow of the road. And if there’s a stretch of road that needs snow fences, it’s definitely I-80 in Wyoming. When the section of I-80 between Laramie and Walcott Junction was first opened in October 1970, there were no snow fences. And guess what? The snow piled up on the interstate! It’s not unusual for the wind to blow in Wyoming –the wind averaged 30 miles per hour days at time. As such, snow drifts up to 16 feet high encroached on the highway in 27 different locations. The interstate had to be closed 10 days during the first three months of this road’s opening due to poor visibility, ice, and crashes. Some researchers did a study on the effectiveness of snow fences on this stretch of highway and determined that the snow fences prevent 78 crashes and 36 injuries each winter. Those are some good numbers! And if you want to see what’s just east of this snow fence – well keep reading. I pulled off I-80 at an exit to get up close and personal to a snow fence in order to take a picture of the snow fence number, and look what I discovered: an old barn. Sometimes, getting off the beaten path can lead to great discoveries. 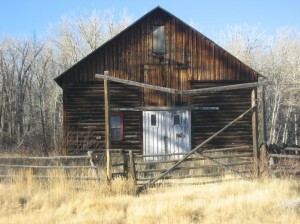 If the walls in this barn could talk, what story would they tell? Would they tell a story of snow? Would they tell a story of life in the high desert of Wyoming before snow fences and interstates? Would they tell a story of cows, horses, hay, tractors? Would they tell a story of years ticking by, one by one?